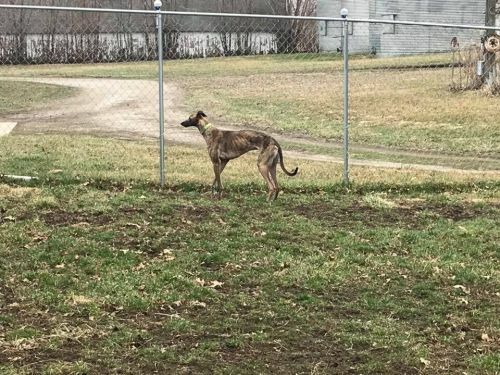 We currently have 2 greyhounds available for adoption. The number of dogs we have fluctuates. We update this list daily. I'm a beautiful young male! Check the Heartland Greyhound Adoption Facebook page for last-minute updates. Or follow us on Facebook and have those updates delivered to your newsfeed! 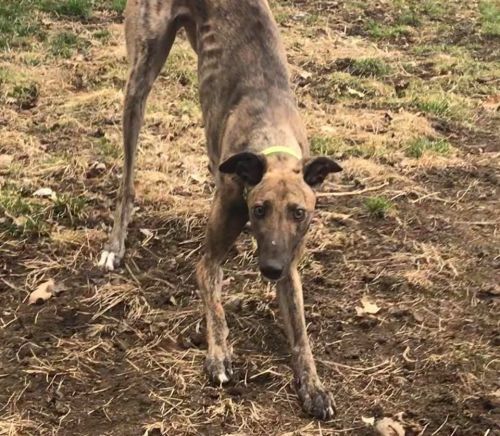 If you would like to meet this dog, please e-mail HGA at adopt@heartlandgreyhoundadoption.org or call 515-967-6564 (please leave a message) and we will get back to you as soon as possible with more information. The adoption fee for greyhounds through HGA is $275. This fee pays for medical costs including spay/neuter surgery, shots, parasite treatments, and teeth cleaning. HGA also microchips every greyhound prior to adoption as a permanent form of ID. The additional cost for this service is $10.99 ($10.99 if you register at the time of adoption through the Petfinder website or phone number) which covers the chip, activation, and membership and is a substantial savings over the usual cost for microchipping. Each dog also comes with a special sighthound collar and leash set and muzzle. There is a $25 non-refundable application fee that is applied to an approved adoption. Debuting Flash! He has been in foster care since October. Why so long? Flash was a year old in September. He is a tiny boy, weighing 55 pounds. He came to HGA with a broken front leg. Undoubtedly broke it playing because he is a puppy. 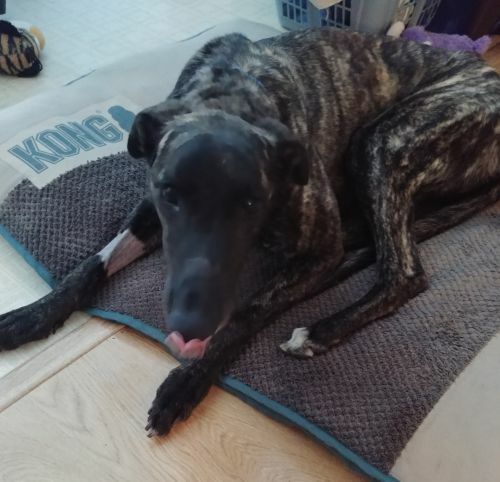 He has had orthopedic surgery. It wasnât completely successful and the break was severe. His front leg is still fragile, and may always be. He uses it as an arm and to balance on. He will need a special home. He is a super sweet boy. Flash is house and crate trained. His perfect home would have very few steps & not too much playing. That is hard for a puppy! He is so sweet, but still needs his mind kept busy. If you are Flashâs special home let us know. 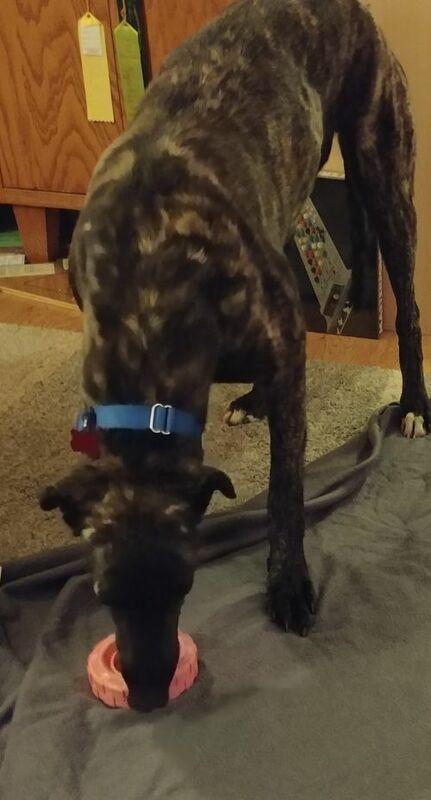 Check the Heartland Greyhound Adoption Facebook page for last-minute updates. Or follow us on Facebook and have those updates delivered to your newsfeed! 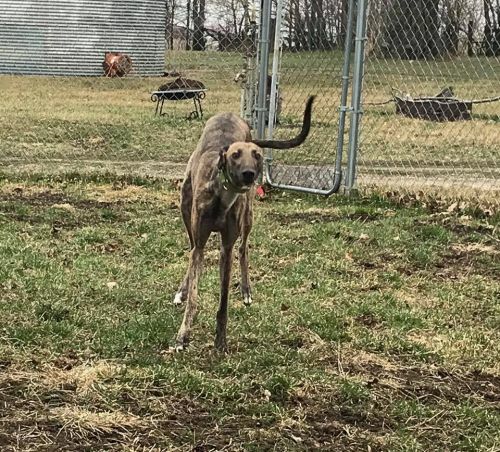 If you would like to meet this dog, please e-mail HGA at adopt@heartlandgreyhoundadoption.org or call 515-967-6564 (please leave a message) and we will get back to you as soon as possible with more information. The adoption fee for greyhounds through HGA is $275. This fee pays for medical costs including spay/neuter surgery, shots, parasite treatments, and teeth cleaning. HGA also microchips every greyhound prior to adoption as a permanent form of ID. The additional cost for this service is $10.99 ($10.99 if you register at the time of adoption through the Petfinder website or phone number) which covers the chip, activation, and membership and is a substantial savings over the usual cost for microchipping. Each dog also comes with a special sighthound collar and leash set and muzzle. There is a $25 non-refundable application fee that is applied to an approved adoption.